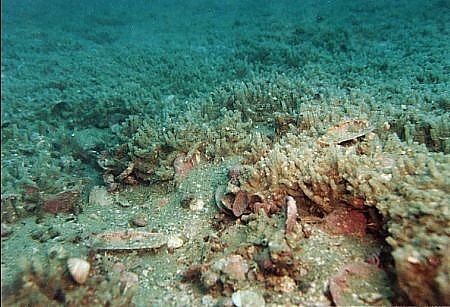 Since about 1995, divers reported seeing whole areas of the sea bed covered in parchment-like tubes. Washed up by storms, these tubes break into millions of parchment shreds that litter our beaches, decaying very slowly. What is happening? In this chapter, meet the culprit, a most sophisticated bristleworm and most likely Chaetopterus variopedatus. It was amazing to observe how quickly the parchment tubes invaded so many places. In the first few years, the tubes were found nestled in between and under rocks but by 1998 they had seeded themselves so profusely that large areas of seabed became covered, particularly the coastal sheltered sandy bottoms in clear water and the deeper sea bed. They were easily identified as belonging to the genus Chaetopterus which has always had a member represented in New Zealand. One would think that identifying a species is relatively simple but this is not so. There are very few people in the world specialising in the study of this kind of worm; people who know all the species of this group of animals and have all the specimens with which to make comparisons. So a number of carefully prepared worms (prepared by staff of the Auckland Museum) have found their way to the other side of the world, waiting to be studied. We would like to know whether this is the same animal that has always been here or if it is a new, invading species. If this is so, it gives one more reason for protecting our seas from illegal aliens, arriving here inside the ballast tanks of ships or otherwise. It also raises the important question of why some animals suddenly increase their numbers so explosively, like the crown-of-thorns starfish in the Australian Barrier Reef. Have conditions in our seas changed? Has its natural predator disappeared? If so, who was it? Will our local fishes learn how to eat it? Will the plague disappear by itself? How many creatures and habitats will be affected adversely? It was not long ago that divers reported the alien mud mussel in the Mahurangi Harbour. It also went through a period of unopposed propagation, but is now hard to find. Was it the cold water of the time that made it thrive? 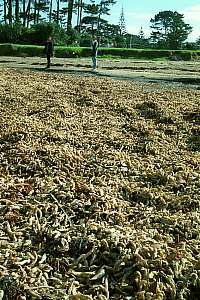 By covering the sandy bottom with a dense mat, the parchment worm makes life for traditional sand dwellers, such as clams (particularly scallops), worms and starfish impossible. These are the losers. 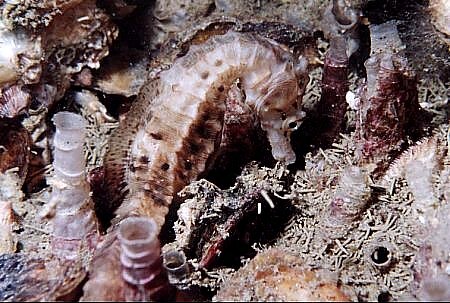 But our little seahorse (Hippocampus abdominalis) is a winner. It is rapt with the enormous expansion of its terrain. In between the parchment tubes it finds many tiny sea slaters and mysid shrimps, while it can hold onto the tubes with its tail, to resist swift currents. 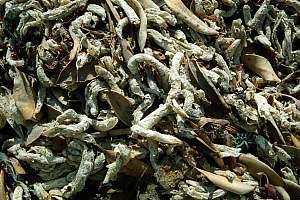 f211016: a thick layer of parchment worm husks, washed up after a storm at Long Bay. f211017: Parchment worm husks are tough but light. These worms were once covered by sand, and cemented closely together like a living mat. But waves dug them up, and ripped them apart, then washed them up onto the beach. Eventually they were swept together to one side of the beach, where they remained for a few days. Then they disappeared mysteriously during a high tide. The parchment worm belongs to the extensive family of bristleworms (polychaetes - poly=many; chaetos=fine hair). These have segmented worm-like bodies with paired legs. This rather complicated looking worm derives its scientific name from two Greek words: chaetos=bristle and pterus=wing, commonly pronounced as kee'topteres, emphasising the 'top' part, but should really be pronounced as two words: kayto-'teeroos. Its name comes from the three paired front legs that are fused into wings. By rowing these wings inside its tube, it causes a current to pass its feeding apparatus. By means of mucus, it traps minuscule plankton organisms which it eats wrapped in its own spit. One always wonders how animals such as snails, shells and tubeworms, living in rigid houses, expand their dwellings. The parchment worm living inside its tube and being cemented to it by a bungi rope, is not able to get outside. Besides, its tube ends in a narrow opening, too small for the animal to pass through. So how can it make the ends grow longer and wider? In order to do so, it must be able to dissolve the old tube while at the same time cementing a new and larger one outside it. It may be able to do so by penetrating the (porous?) parchment with its cement glands, through growth 'cracks' much like the seams in a human skull. parchment worm tubes at night. 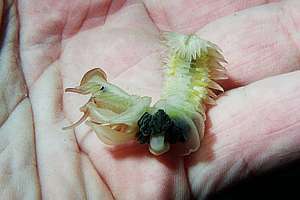 The Chaetopterus parchment tubeworm feeds by fanning water through its home tube with its wing-like legs (fan parapodia). A bag of slime is excreted from two feeding legs (aliform notopodia). Water flows into this bag and out through its side, trapping tiny algal and mud particles. At its bottom end, the bag is continuously rolled up into a ball by the food cup. Once the ball is big enough, the bag is rolled up entirely and the compact ball of mucus transported to the mouth over a conveyor belt of whipping hairs (ciliated dorsal groove). Note that the parchment worm species shown in the drawing lives underground, whereas our invasive species settles on top of the sea bottom. 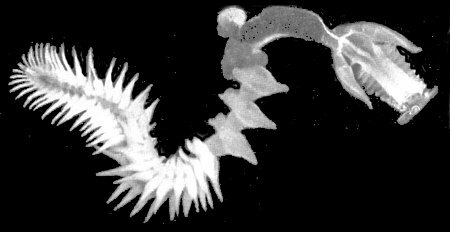 Diagram of a parchment tubeworm and its feeding apparatus.